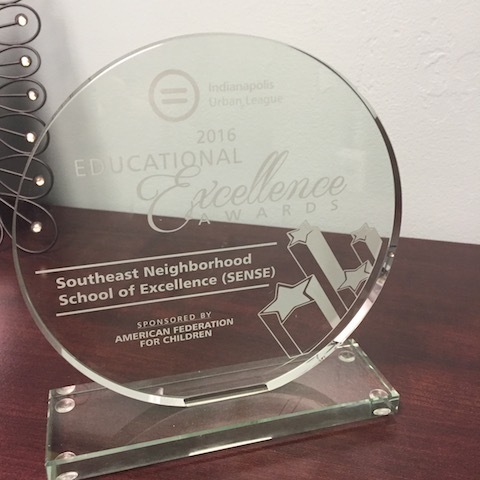 The Indianapolis Urban League recognized SENSE Charter School for its ongoing commitment to excellence as exemplified by: offering a robust special education programming that has had a dramatic impact on the academic, social, and emotional development of our students with IEPs. The school's ability to support and sustain high quality gen education co-teaching, while also supplying a highly qualified special education staff for each and every classroom means that SENSE actually tri-teaches (3 teachers supporting each class). SENSE Charter School is so appreciative of the Indianapolis Urban Leagues committment to educational excellence and innovation in all schools regardless of venue or type. We are so honored to be recognized with this prestigious award.